Fifteen CFOs, mostly from tax-exempt organizations, gathered at the Community FoodBank of New Jersey where they sorted and repacked food for distribution to more than 900,000 hungry people in New Jersey. What made this volunteer endeavor particularly impactful was that it was held two days before Thanksgiving. They came together as part of the CFO Studio Executive Dinner Series, and though this one was held in an unusual location, it featured excellent conversation and food for thought for CFOs of tax-exempt organizations — as well as an impressive dinner prepared by a culinary team that is part of the Community Kitchen, the FoodBank’s Food Service Training Academy. The group discussed all that goes into becoming a charity of choice. Mr. Barry gave specific examples from the Community FoodBank. He explained that Kathleen DiChiara, who started the organization by feeding the hungry out of the trunk of her car in 1975, instilled in the staff the fact that “no” is not an option. Ms. Marks Young’s mantra is similar. “There is no room for failure in our roles because we need to continue to provide quality services to those most in need.” Since 2006, Ms. Marks Young has overseen all of the financial functions for Easter Seals New Jersey, ensuring its resources are properly allocated to achieve its long-term strategic goals. Easter Seals New Jersey is a 501(c) (3) not-for-profit organization that since 1948 has enriched the lives of people living with disabilities and special needs, and those who care about them, by providing opportunities to live, learn, work, and play in their communities. Annually, nearly 9,000 people or families in New Jersey affected by developmental disabilities, including autism, physical disabilities, and mental illness, participate in programs designed to help them address life’s challenges and achieve their personal goals on the path toward independence. Among Ms. Marks Young’s accomplishments is boosting funding for services by $22 million, enabling the organization to increase by nearly 20 percent the number of people with disabilities or special needs served. She has also served as a consultant and advisor to other Easter Seals affiliates across the nation by sharing her expertise in cash management, financial systems, and financial leadership. The participants agreed that running a not-for-profit can be a balancing act. A solid infrastructure is vital, as is balancing overhead costs. Transparency is key as well. Open communication with donors, the executive leadership team, staff, and board of directors is important, but there are many more populations that must be addressed. Many in the room referred to the book Uncharitable: How Restraints on Nonprofits Undermine Their Potential, by Dan Pallotta, which examines the constraints put on not-for-profits by the public. A parallel theme in the book and at the CFO Studio Executive Dinner was that not-for-profits must be allowed to use the tools of commerce to thrive and accomplish their missions. 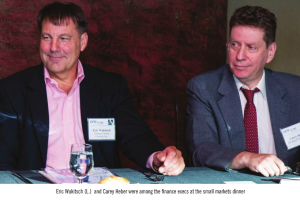 “To Lead, or Not to Lead,” that was the question, during a CFO Studio Small Markets and Emerging Growth Companies Executive Dinner, held recently at Red Knot at Galloping Hill in Kenilworth, NJ. 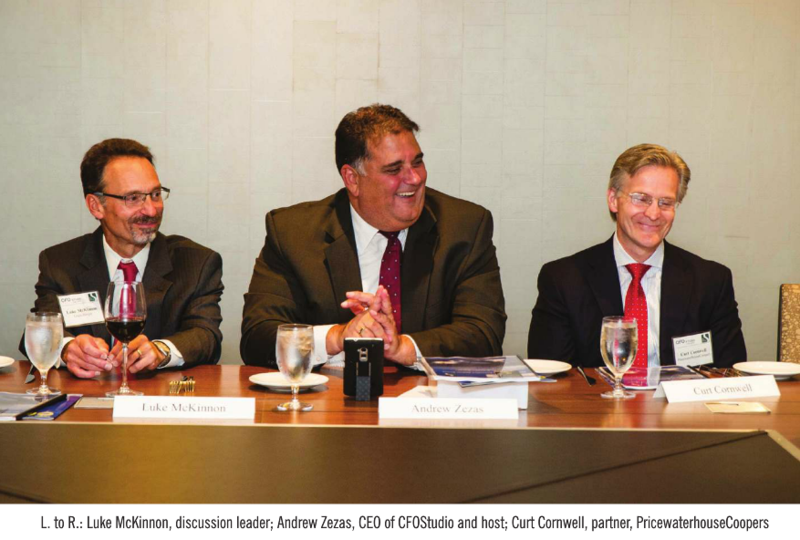 Bill Craig, Chief Executive and CFO of Tarantin Industries, a wholesale distributor of propane equipment, heaters, and hearth products, was discussion leader, and Andrew Zezas, Publisher of CFO Studio magazine, and Host of CFO Studio, facilitated the conversation. The 22 CFOs in attendance offered their tried-and-true strategies for becoming successful leaders, with a few rejecting the premise that certain people are born leaders and others are not. What successful leaders have in common, the group agreed, is substance, integrity, and a vision — not just style and image. Leaders establish connected relationships and inspire colleagues. They bring teams together around a shared purpose and a common set of values. When you look at great leaders, whether in the military or in business, they are willing to put themselves at risk, if necessary, and to lead by example. Effective leaders are transparent. “I start my day by saying good morning to everybody. That’s important because it’s my opportunity to say, ‘How’s it going? What do you have to do today? Any problems that you had yesterday? Do we need to talk about anything?’ It’s my first chance to interact with everyone. 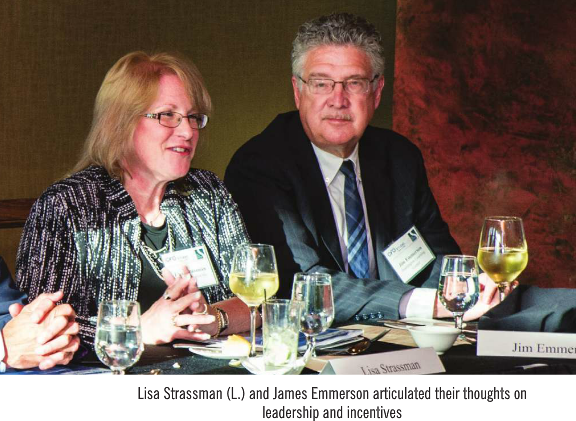 I lead with communication,” said Ron Tassello, CFO of Bardwil Industries, based in Hasbrouck Heights, NJ, a textile manufacturer of fine kitchen and bath products and linens. Leadership is not static; it is constantly evolving. “I’m required to demonstrate multiple types of leadership, because if I’m dealing with the factory workers and managers, they need one type of leadership. When I deal with IT, they require a different type of leadership,” said Eric Wukitsch, COO and CFO, Vantage Custom Classics, an Avenel, NJ–based manufacturer of identity apparel. A common challenge is dealing with business owners, the attendees agreed. When leading a group where one has established authority, those whom you lead are compliant to a certain extent. Leading a leader creates a different set of challenges. “I don’t think anybody in this room will dispute that there are times when ownership has grandiose plans and we have to bring them back to reality,” said Mr. Wukitsch. It’s important to know when to push and when to back off, when to lead and when to serve. “You’ve got to get them on the same wavelength, then you can lead. That is so important,” said Ed Schultz, Principal of Allendale, NJ–based Highland Business Group, a consulting firm. “Is one born with the capacity to lead or is it an acquired skill?” a question that has been debated for decades, became an important component of the conversation during this CFO Studio Executive Dinner. “You are either born with it, or you’re not. If you don’t have it, you can develop it a bit, but you’re never going to be an effective leader,” said Walter Cirillo, Vice President, Treasurer of Edison, NJ–based AeroGroup International, which designs, imports, and distributes Aerosoles footwear. “Leadership traits are not learned in school. You are born with the ability to know when and how to get in front to rally your troops to victory,” added Robert Berkowitz, CFO of Pine Brook, NJ–based Wilmington Paper Corporation, specializing in recycling-management programs. Creating an environment of empowerment is one of the ways successful leaders lead. Employees know they are being heard and respected and that the organization values their contributions. Dancker, Sellew & Douglas (DS&D), a Somerville, NJ–based interior solutions firm, has been in business for more than 180 years. In 2012, the current CEO became the majority owner of the company and implemented a six-person leadership team from all different backgrounds with varied skill sets, said William Hendry, DS&D’s CFO. In order to ensure the leadership team is working as a cohesive unit, company leaders participate in leadership training every Wednesday for two hours and during two off-site events held every spring and fall. Employees who are engaged and feel good about the environment in which they work will be more productive. It’s important to remember that when it comes to employee engagement, a one-size-fits-all mindset can be an ineffective approach. “I have lived in many countries, and have learned that what worked in one part of the world would not necessarily work in another. For example, in Chile you have to be a very formal leader, because even the doorman wears a suit in the summer. In Puerto Rico, I would take my people to a bar for drinks some Friday evenings to build camaraderie and to get them engaged with each other,” said Javier Daly, CFO, TerraCycle, a Trenton, NJ–based recycler of post-consumer waste. A successful leader is authentic, genuine, and recognizes the motivations of those he or she leads. “Understanding the culture of an organization, either as it exists or as it should become, and then making sure that the style of leadership coincides with that culture, is essential,” said Mr. Zezas. Genuineness and authenticity are important traits of a great leader, agreed Tobey Rumack, CFO, Universal Marine Medical Supply International, a Staten Island, NY–based maritime industry supplier. “One can be a great communicator, but if that person is not genuine, their followers will eventually become disenchanted. When there is not trust, followers will not go the extra mile,” said Ms. Rumack. Improving their own listening skills, decreasing conflict, and controlling impulsive reactions help leaders develop. These traits are often referred to as emotional intelligence. “There are three legs to success. One is your IQ that you are born with. Second is your acquired knowledge. The third leg is the one that I find so many people overlook. It’s probably the most important one — emotional intelligence — the ability to relate with people,” said Howard Reba, Finance Operations Group Director of California-based Marlin Equity Partners, a global investment firm. Not only are empathy and emotional intelligence important, but so is trust. You can have a clear-cut vision, an ironclad strategy, and successful communication skills. But if the team doesn’t trust you, you will not be effective. “When you build a relationship, that person will go the extra mile for you,” said Fred Guerra, Vice President, Finance of Rockleigh, NJ–based Takasago International Corporation, a flavor and fragrance company. Employers are gearing up for millennials, a generation that is not afraid to move from one job to the next. “My dad worked 40 years in the same place. Our kids will be far different,” said Michael Roth, CFO, Beefeaters Holding Company, a North Bergen, NJ–based manufacturer of dog treats. Some have perfected their leadership skills by being exposed to ineffective leaders. “When I was coming up in the ranks, there were times when I wasn’t treated well by some leaders, and I think that impacted me to be respectful of people. When you’re respectful, you’re going to get more out of people than by pounding a hammer,” said Carey Heber, CFO of Carlstadt, NJ– based Advanced Polymer, a specialty chemical company. Mr. Craig had a similar experience. “I learned what to do by learning what not to do,” he said. “What this is all about is creating a culture within an organization that allows and promotes cream to rise to the top, for lack of a better analogy. You are allowing employees to become leaders. …You are allowing them to blossom,” said Mr. Guerra. Good leaders make the tough decisions that need to be made. “They say, for the greater good, this person needed to go,” said Mr. Tassello. The most successful leaders are authentic, the group agreed, they are self-aware and genuine and mission-driven and focused on results. They lead with their heart, not just their minds, with substance, integrity, and a vision — not just style and image. Some are born, some are made. They establish connected relationships and inspire colleagues. They bring teams together around a shared purpose and a common set of values. They lead by example. 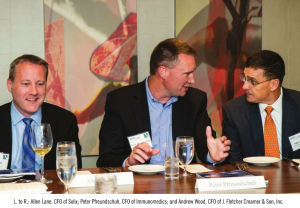 Going after private equity funding was the focus of a CFO Studio Executive Dinner held at Blue Morel in Morristown, NJ. Luke McKinnon, recently having served as Chief Financial Officer of a global engineering services company, was the discussion leader. “Going out and raising priv ate equity is a huge effort,” said Mr. McKinnon. Successful private equity firms have financial controls in place that focus on the basics of performance— revenue, operating margins, and cash flow. McKinnon was tasked with finding a long-term minority-interest investor for the global engineering services company he was part of, one who would be willing to have a seven- to ten-year relationship. 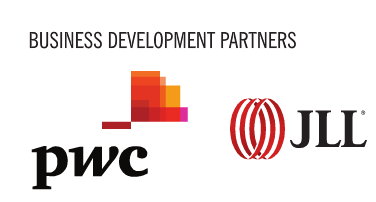 “We found three firms interested in this length of term. Although they are called private equity, many of those investment companies are more family-run type places,” explained McKinnon. The company McKinnon was with was global in nature, with operations in countries including Afghanistan, Iraq, Sudan, the Congo, Vietnam, Thailand, and Indonesia. “At one point, I had 2,000 bank accounts around the world,” said McKinnon. This wasn’t the only challenge the private equity firm had to contend with. “They are focused on Day Sales Outstanding (DSOs) and cash flows,” said McKinnon. Delayed payments have become the norm. Historically, government agencies are known to be sluggish. “We provide engineering and consulting services to the government sector, mainly municipalities and counties, and they’re always dealing with funding and processing issues, so we’re probably at 115 to 130 days,” said Michael Dentici, Senior Vice President, Chief Financial Officer, T&M Associates, an engineering, planning, and environmental consulting firm based in Middletown, NJ. Procurement and finance are becoming more interwoven than ever. “We’ve been involved in deals where the client’s procurement executives say, ‘We require 60- to 90-day terms, to which we counter that our prices will go up 15 percent, to which the client often agrees. This makes absolutely no financial sense, because the 15 percent fee increase is much more than the cost of money. There is a disconnect in the performance systems and communications between procurement and finance when this happens,” said Mr. Baldwin. John McAndris Jr., Chief Financial Officer and Vice President of Finance, JJM Consulting, LLC was previously in charge of Latin America for Pfizer/Wyeth. “Venezuela is a country that is very tough, as many companies there never release money. You have to go to the government to get a special dispensation to get the money out of the country,” he explained. 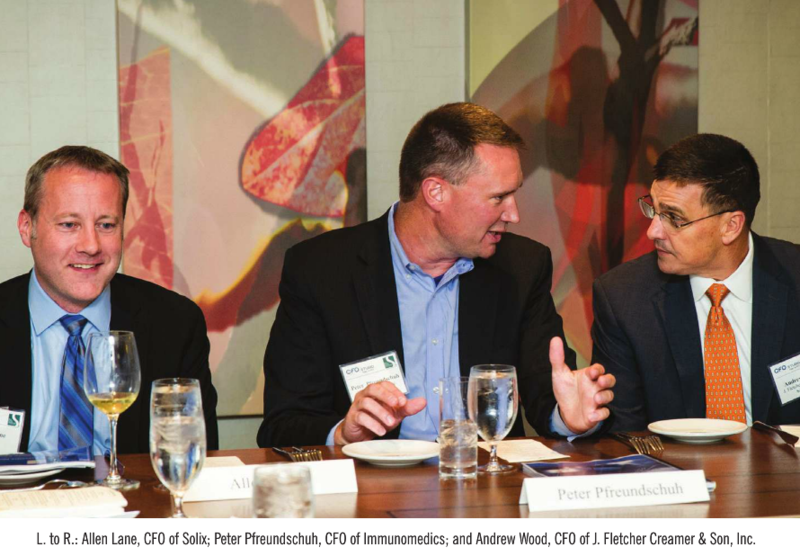 This discussion put things in perspective for Andrew Wood, Chief Financial Officer, J. Fletcher Creamer & Son, Inc., a Hackensack, NJ–based contractor. “About half of our work is with government agencies and the other half is with private companies. Most of our work is with utility companies, which are semi-regulated. I used to complain…until I heard you guys. Our DSOs are in that 65- to 68-day range, which is not that bad, compared to all of you,” said Wood. Selling accounts receivable is a standard form of managing cash flow and is something with which Gunther Mertens has experience. Mr. Mertens is President, North America Region of Elmwood Park, NJ– based Agfa Corporation, the North American arm of global imaging leader Agfa-Gevaert N.V. “Our DSO is actually 45 days, which is good. But what we see is that some bigger companies are asking us to offer extended-payment terms beyond the standard 30 days, in exchange for a supplier-side financing program,” said Mertens. Prioritizing revenue cycle issues was of paramount interest to most CFOs at the CFO Studio Executive Dinner. “If you don’t bill them, they don’t pay. The start-up time is in the invoice. 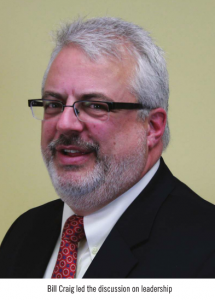 If you change the terms of your agreements, so that your billing point is earlier, you can actually move forward the payment,” said Barry Lederman, Chief Financial Officer, Whippany, NJ–based Halo Pharmaceutical, a contract development and manufacturing organization that provides scientific and development expertise. The correct fit is important. “There are two things to consider: style and strategy. Does everybody agree about what the company is going to look like in the future? Is there knowledge of the industry and can you really get along with these folks? What is their style going to be on a tactical basis, too?” ponders New York City–based Curt Cornwell, Partner, Transaction Services, PricewaterhouseCoopers, a leading professional services network, and a CFO Studio Business Development Partner. Many agreed with Savadelis. “I concur, as the VC model typically includes raising a fund that is very industry-centric,” said Gregg Kam, Chief Financial Officer, Sonneborn, a Parsippany, NJ–based manufacturer and supplier of high-purity specialty hydrocarbons. When preparing for private equity, sell-side reports have become a trend, according to PricewaterhouseCoopers. A selling company has an accounting firm come in, prepare a quality earnings analysis, a debt analysis, as well as details on trends being experienced, and that book goes out. Mr. McAndris of JJM Consulting said sell-side reports help from another perspective. “You can steer the course of where you want the buyer to look. You’re controlling the conversation,” he added. In some instances, these procedures are not necessary. “We were headed down the road of going public and [our investors] came along and made us an offer that was about 50 percent above our projected IPO price. That’s what we call a no-brainer,” said Bert Marchio, Chief Accounting and Operations Officer, Edge Therapeutics, a Berkeley Heights, NJ–based clinical-stage biopharmaceutical company.